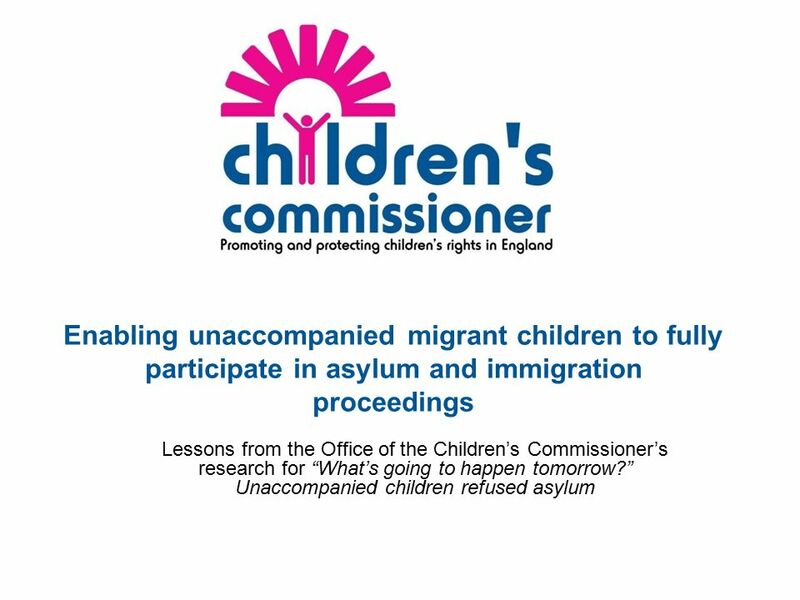 Enabling unaccompanied migrant children to fully participate in asylum and immigration proceedings Lessons from the Office of the Children’s Commissioner’s. 2 Why the child’s full participation is so important Enabling participation in proceedings can ensure that the child’s voice is heard and that as much relevant information as possible is put before the decision maker. 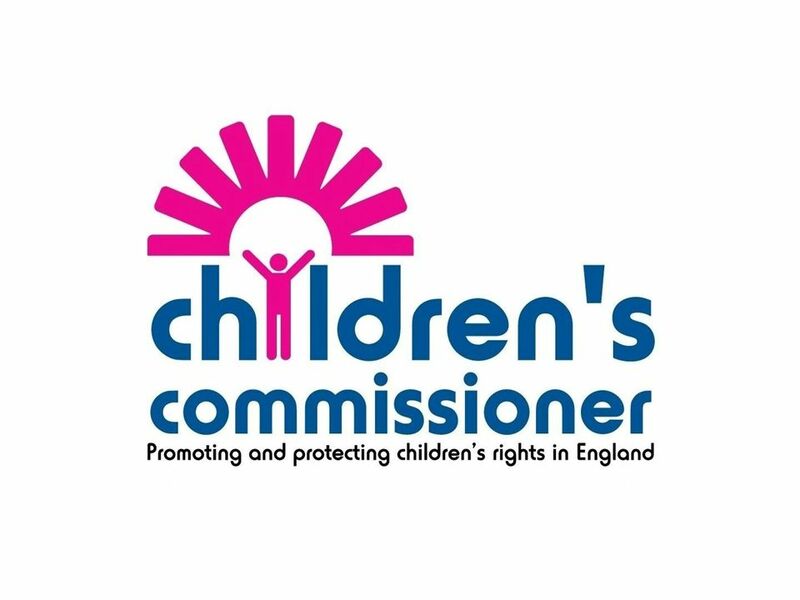 Enabling participation can provide a sense of assurance to the child that they have been listened to and that their views and wishes have been taken into account – whatever the outcome of their application. 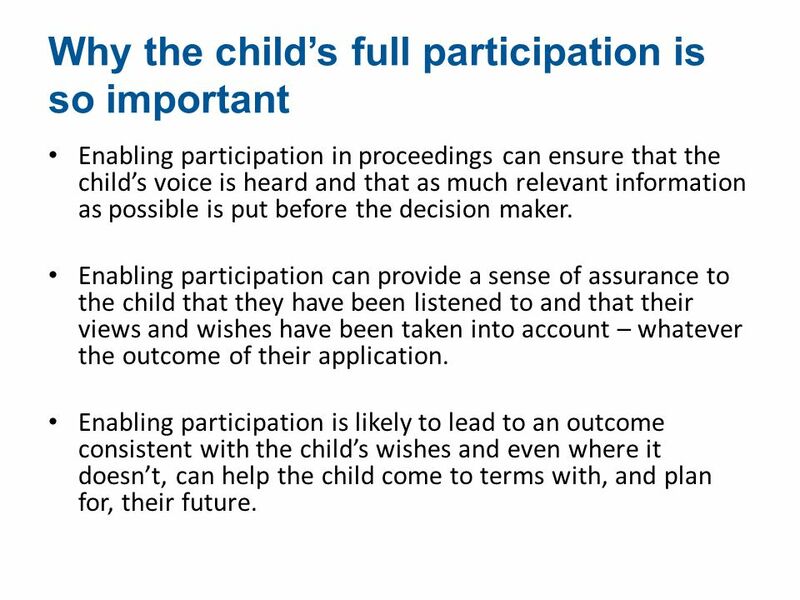 Enabling participation is likely to lead to an outcome consistent with the child’s wishes and even where it doesn’t, can help the child come to terms with, and plan for, their future. 3 Children have a right to participate! 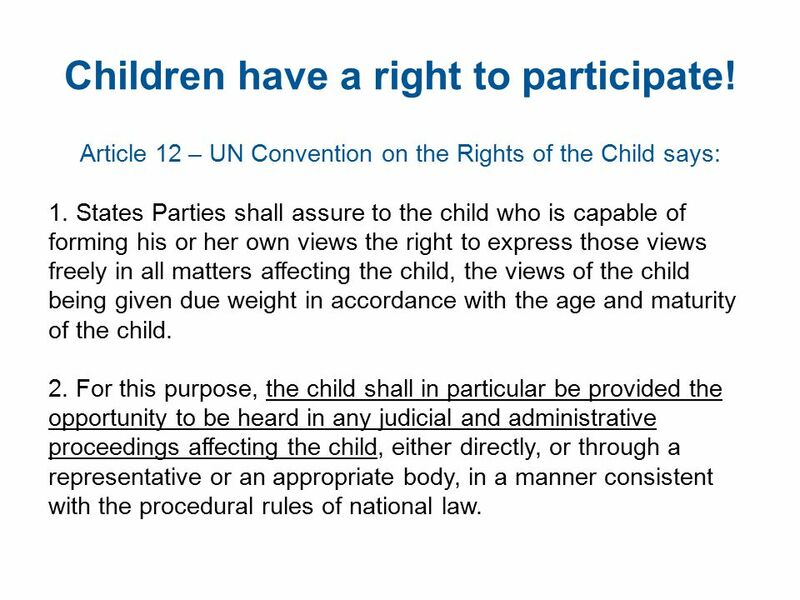 Article 12 – UN Convention on the Rights of the Child says: 1. States Parties shall assure to the child who is capable of forming his or her own views the right to express those views freely in all matters affecting the child, the views of the child being given due weight in accordance with the age and maturity of the child. 2. For this purpose, the child shall in particular be provided the opportunity to be heard in any judicial and administrative proceedings affecting the child, either directly, or through a representative or an appropriate body, in a manner consistent with the procedural rules of national law. 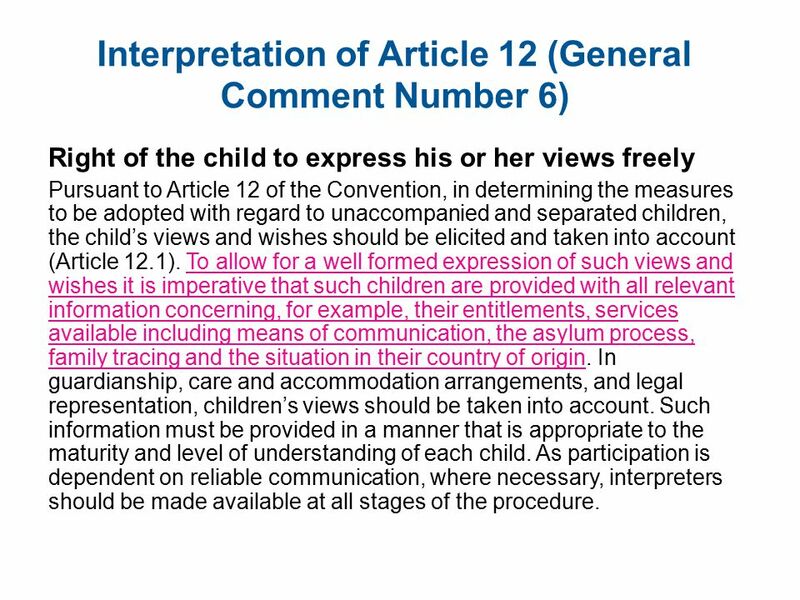 4 Interpretation of Article 12 (General Comment Number 6) Right of the child to express his or her views freely Pursuant to Article 12 of the Convention, in determining the measures to be adopted with regard to unaccompanied and separated children, the child’s views and wishes should be elicited and taken into account (Article 12.1). To allow for a well formed expression of such views and wishes it is imperative that such children are provided with all relevant information concerning, for example, their entitlements, services available including means of communication, the asylum process, family tracing and the situation in their country of origin. 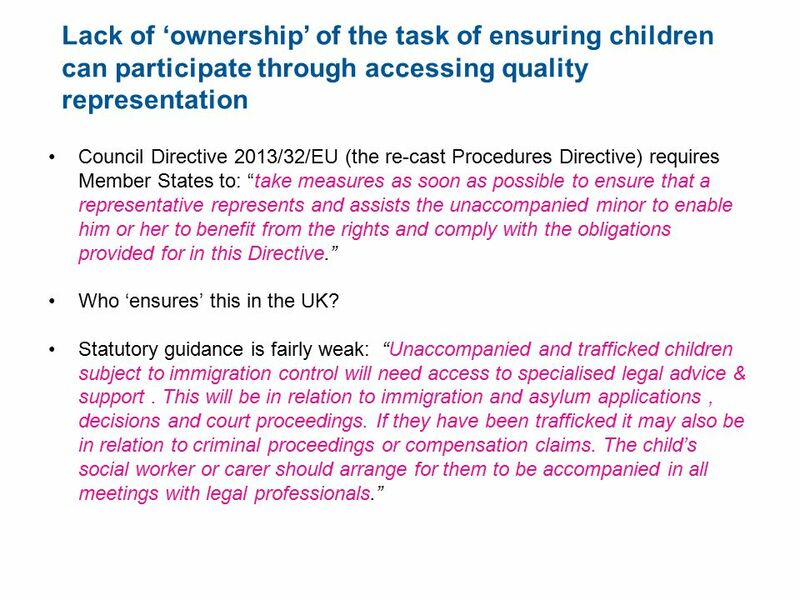 In guardianship, care and accommodation arrangements, and legal representation, children’s views should be taken into account. Such information must be provided in a manner that is appropriate to the maturity and level of understanding of each child. As participation is dependent on reliable communication, where necessary, interpreters should be made available at all stages of the procedure. 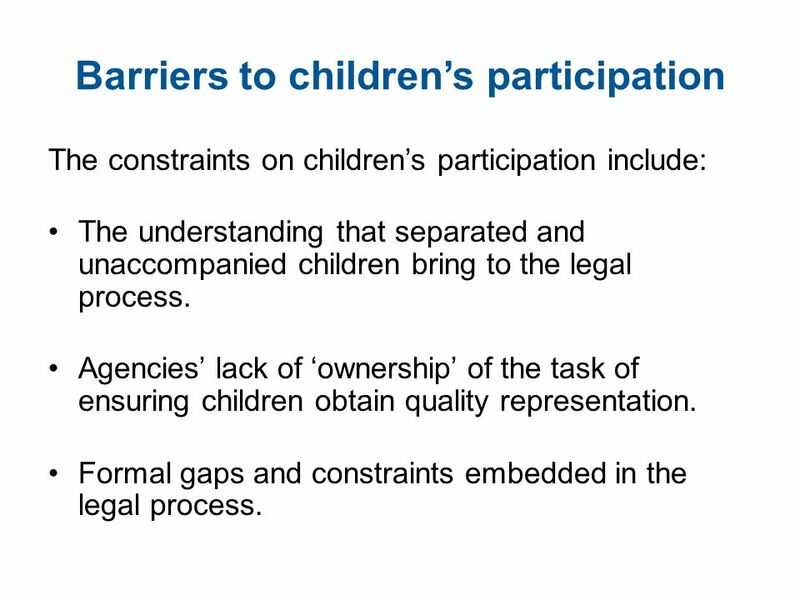 5 Barriers to children’s participation The constraints on children’s participation include: The understanding that separated and unaccompanied children bring to the legal process. 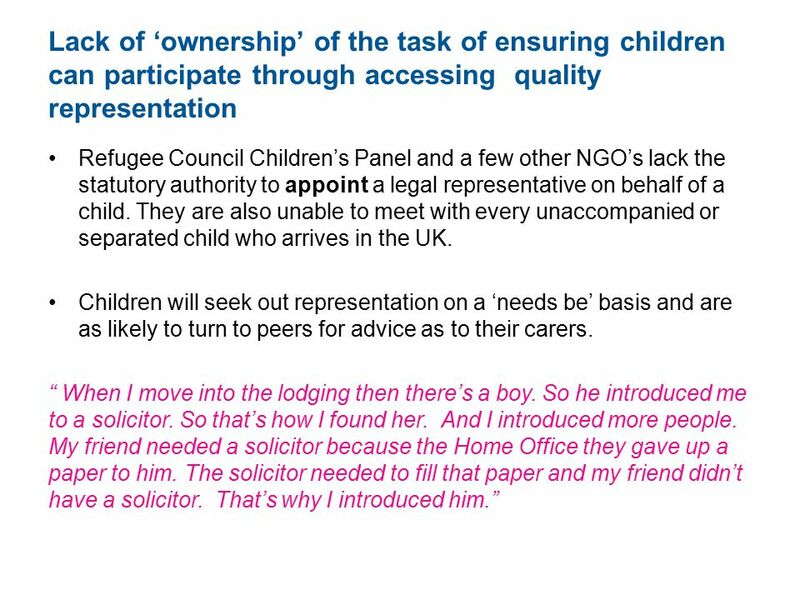 Agencies’ lack of ‘ownership’ of the task of ensuring children obtain quality representation. 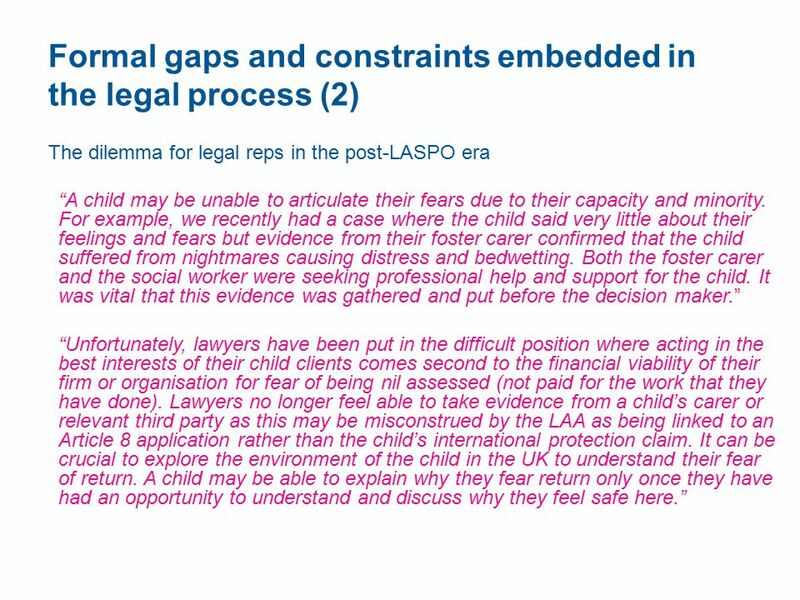 Formal gaps and constraints embedded in the legal process. 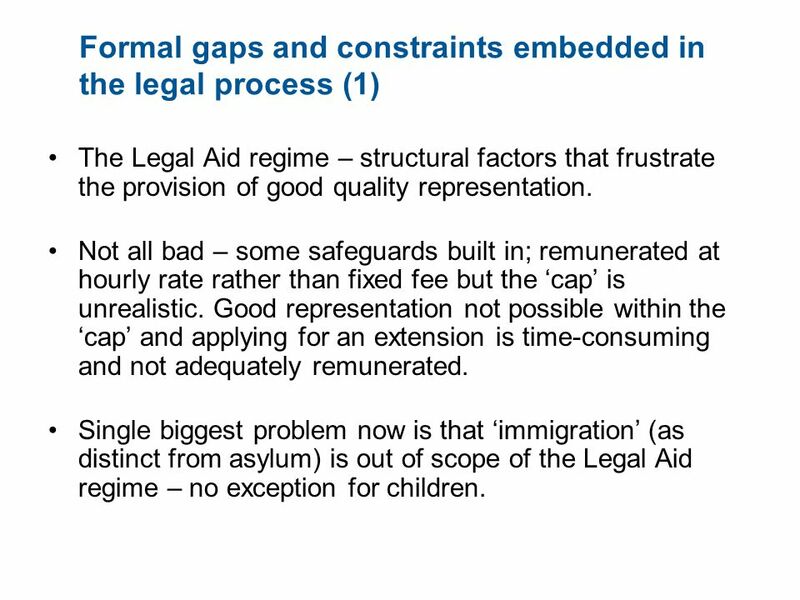 10 Formal gaps and constraints embedded in the legal process (1) The Legal Aid regime – structural factors that frustrate the provision of good quality representation. Not all bad – some safeguards built in; remunerated at hourly rate rather than fixed fee but the ‘cap’ is unrealistic. Good representation not possible within the ‘cap’ and applying for an extension is time-consuming and not adequately remunerated. 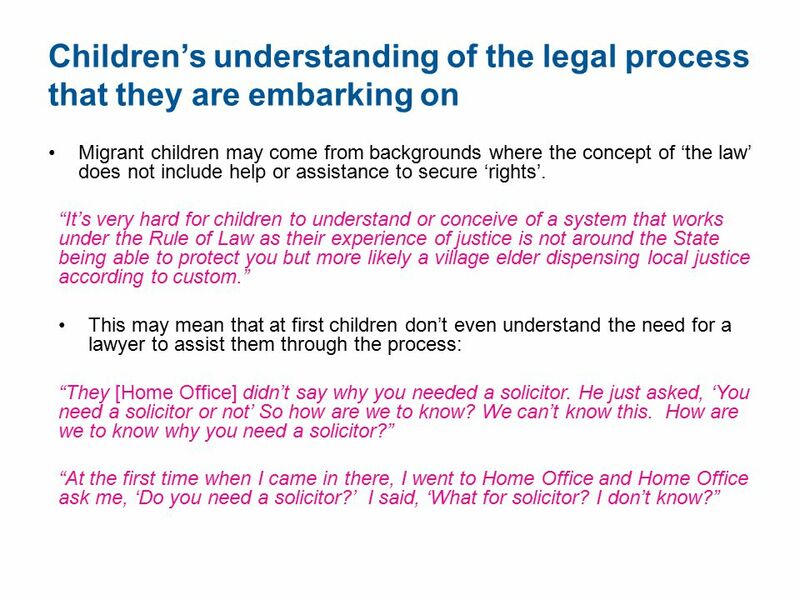 Single biggest problem now is that ‘immigration’ (as distinct from asylum) is out of scope of the Legal Aid regime – no exception for children. 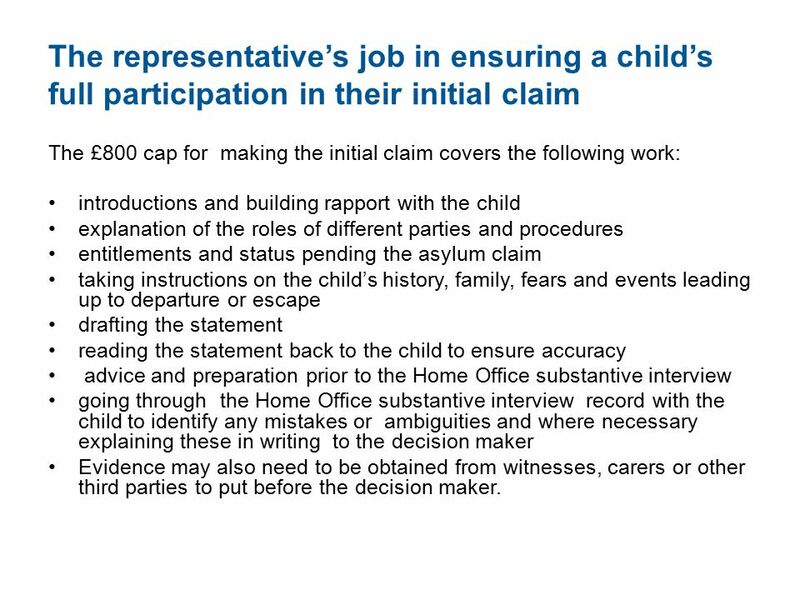 11 The representative’s job in ensuring a child’s full participation in their initial claim The £800 cap for making the initial claim covers the following work: introductions and building rapport with the child explanation of the roles of different parties and procedures entitlements and status pending the asylum claim taking instructions on the child’s history, family, fears and events leading up to departure or escape drafting the statement reading the statement back to the child to ensure accuracy advice and preparation prior to the Home Office substantive interview going through the Home Office substantive interview record with the child to identify any mistakes or ambiguities and where necessary explaining these in writing to the decision maker Evidence may also need to be obtained from witnesses, carers or other third parties to put before the decision maker. 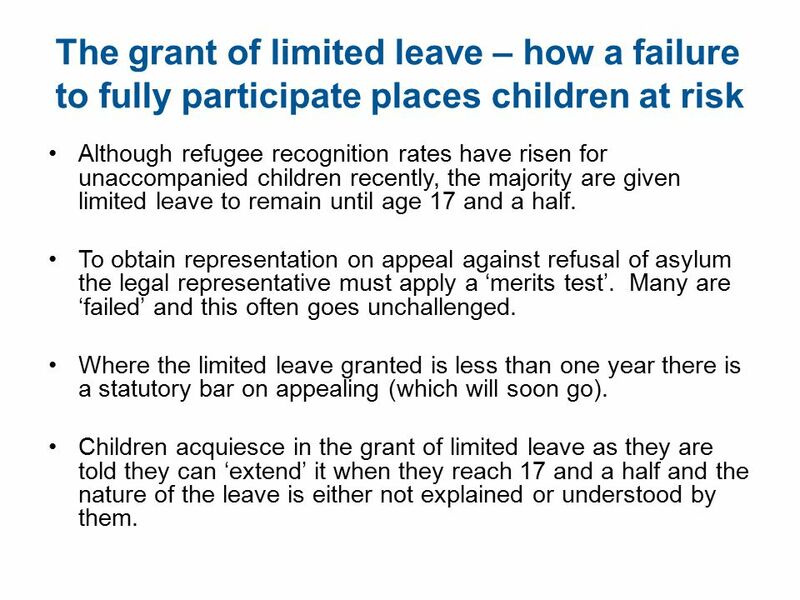 13 The grant of limited leave – how a failure to fully participate places children at risk Although refugee recognition rates have risen for unaccompanied children recently, the majority are given limited leave to remain until age 17 and a half. To obtain representation on appeal against refusal of asylum the legal representative must apply a ‘merits test’. Many are ‘failed’ and this often goes unchallenged. Where the limited leave granted is less than one year there is a statutory bar on appealing (which will soon go). 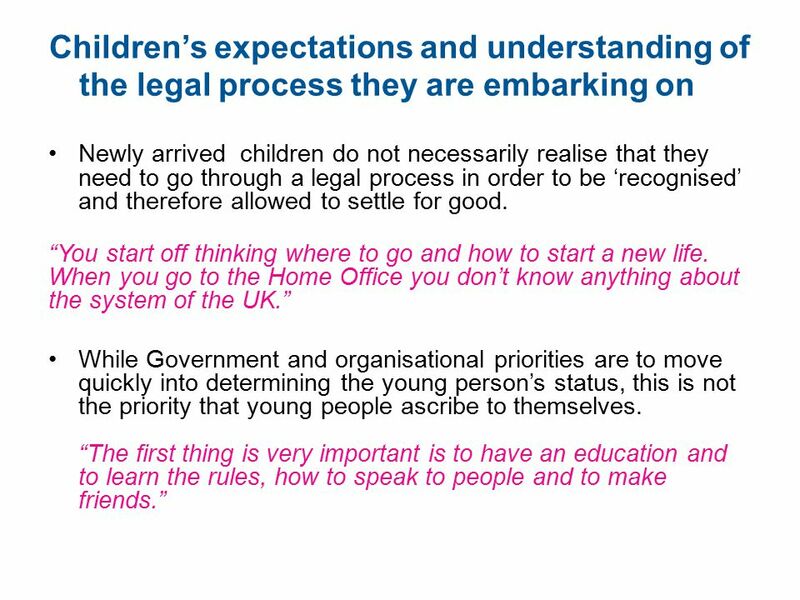 Children acquiesce in the grant of limited leave as they are told they can ‘extend’ it when they reach 17 and a half and the nature of the leave is either not explained or understood by them. 14 Visa or deferred removal? 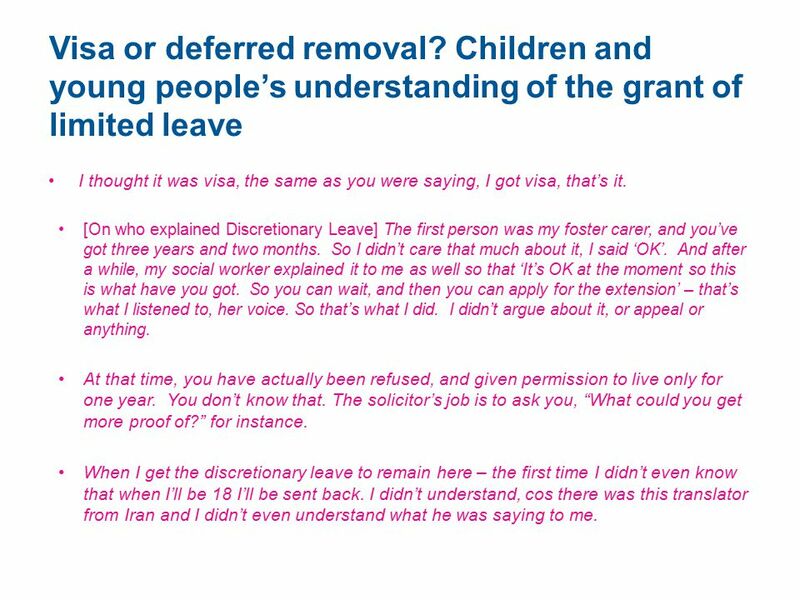 Children and young people’s understanding of the grant of limited leave I thought it was visa, the same as you were saying, I got visa, that’s it. [On who explained Discretionary Leave] The first person was my foster carer, and you’ve got three years and two months. So I didn’t care that much about it, I said ‘OK’. And after a while, my social worker explained it to me as well so that ‘It’s OK at the moment so this is what have you got. So you can wait, and then you can apply for the extension’ – that’s what I listened to, her voice. So that’s what I did. I didn’t argue about it, or appeal or anything. At that time, you have actually been refused, and given permission to live only for one year. You don’t know that. The solicitor’s job is to ask you, “What could you get more proof of?” for instance. When I get the discretionary leave to remain here – the first time I didn’t even know that when I’ll be 18 I’ll be sent back. I didn’t understand, cos there was this translator from Iran and I didn’t even understand what he was saying to me. 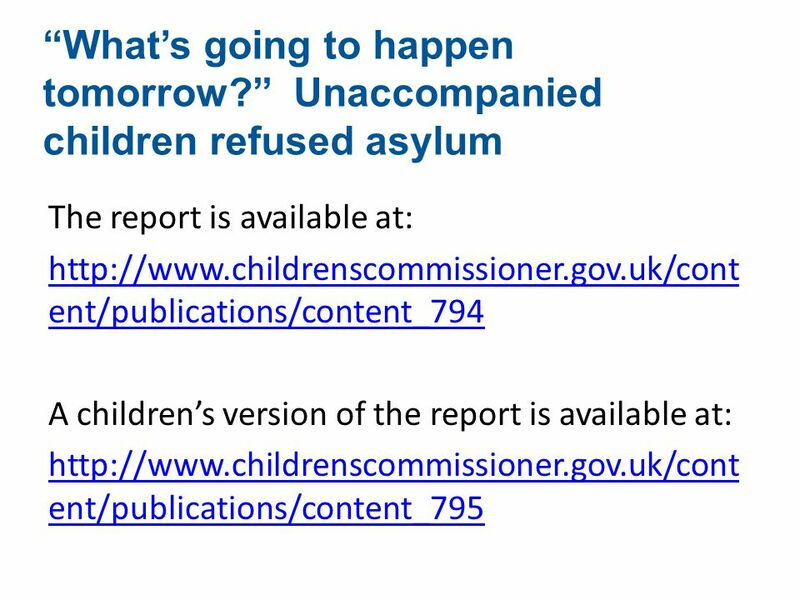 Download ppt "Enabling unaccompanied migrant children to fully participate in asylum and immigration proceedings Lessons from the Office of the Children’s Commissioner’s." Mainstreaming Childs Rights in the EU Policy Area of Asylum and Migration Rebecca ODonnell Euronet Seminar October 9, 2007. DAVID ARCHARD PROFESSOR OF PHILOSOPHY What does it mean to have a right of participation? Young People and Commissioning ok.org.uk/integratedcommissioning. 1 FIFTH ANNUAL COAT CONFERENCE NSW CHAPTER DEALING WITH DIFFICULTIES IN THE ABSENCE OF LEGAL REPRESENTATION The Hearing Process In the Absence of Legal. The Brussels II Regulation The jurisdiction of courts. Child-friendly justice system. Parallel civil and administrative proceedings in Estonia Leanika Tamm, civil judge Viru County Court, Estonia Tallinn 2015. CARE ACT SEMINAR ADVOCACY Correct as at March 2015. NGO's and Participation. International Non-Governmental Organisations with a child focus UNICEF Plan Oxfam Catholic Relief Services CARE International. PDMU Team 2010/2011 Daphne Wilson.